We all know that Vitamin C is one of the greatest nutrients that delivers lots of benefits to our health, and also to our skin. 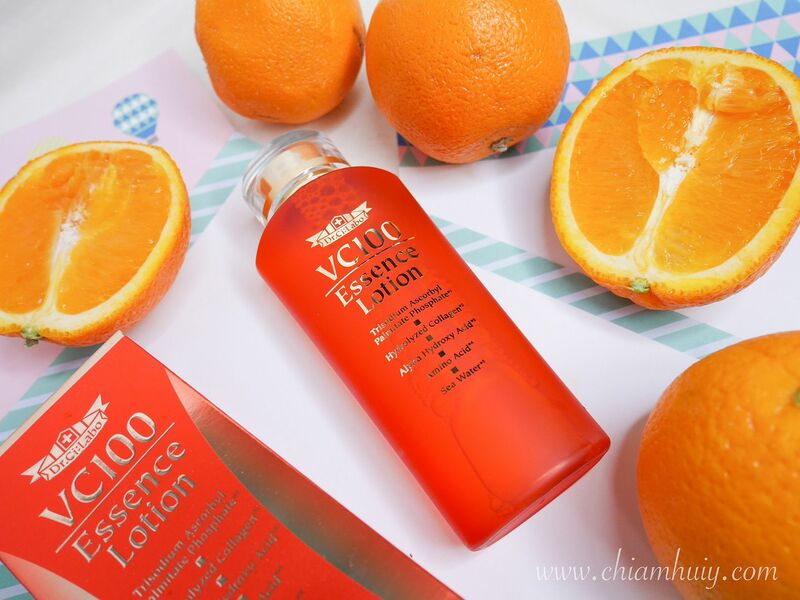 If you are looking for the product that best delivers the benefits of Vitamin C to your skin, then Dr.Ci:Labo VC100 Essence Lotion could just be that perfect lotion that you're looking for. My first impression of Dr.Ci:Labo cannot escape the impression of medical, due to the title "Dr" at the front of the brand. Precisely as the name suggests, Dr.Ci:Labo is first created by its founder Dr.Yoshinori Shirono M.D, PhD. It soon turns into Japan’s No. 1 Doctor’s Brand Cosmetics with one of the best selling cosmetic skincare - Aqua-Collagen-Gel. After the stunning results shown from Aqua-Collagen-Gel, Dr.Ci:Labo continues to strive to bring about solutions to skin issues. Through continually innovating and researching in cutting edge dermatological technology, Dr.Ci:Labo launched more skincare products, which include the product that I'll be reviewing today, the VC100 Essence Lotion. The essence lotion contains a concentration of up to 200% of high permeability vitamin C derivative “APPS”. That means, this derivative is akin to vitamin C, bringing out the same equal benefits but gets absorbed much easier than vitamin C, maximising the amount of benefits your skin can absorb. Can you imagine that this essence lotion is actually as good as a serum? So what's so good about this derivative? The “high permeability vitamin C derivative (APPS) permeability, 100 times that of vitamin C of both water-soluble vitamin C, which is “fast-acting”, and oil-soluble vitamin C, which is “long-lasting”, and is used in prescriptions by cosmetic dermatologists. In addition, by also simultaneously incorporating 3 different types of vitamin C derivatives and “citrus unshiu peel extract", it works to promote collagen synthesis and suppress catabolic enzymes for pore-less, translucent skin with resilience and elasticity. 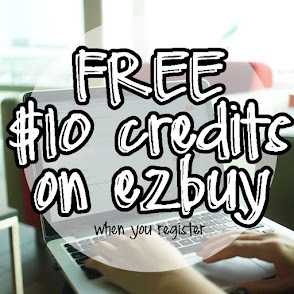 It also contains 2 types of EGF-like ingredients, 3 types of fruit acids, and fullerene, empowering ingredients that draw out the power of vitamin C and act on aging skin. High-function beauty ingredients leave skin looking youthful. We also focused on “water”, a crucial ingredient in lotions, using 100% deep-sea water from Toyama Bay, which has the ultimate balance of minerals. Credits: Dr.Ci:Labo. 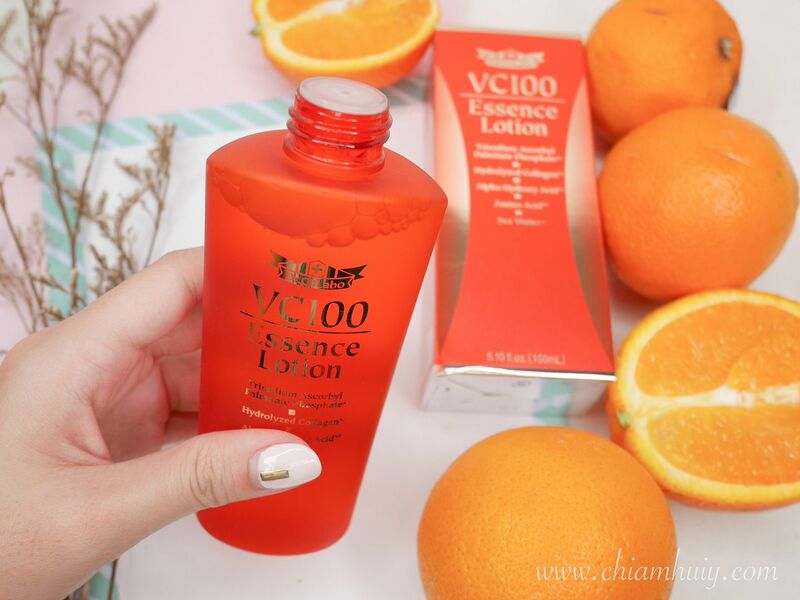 For more details and scientific background of Dr.Ci:Labo VC100 Essence Lotion, do visit Dr.Ci:Labo website. When first dispensed onto my palm, it feels just like water. 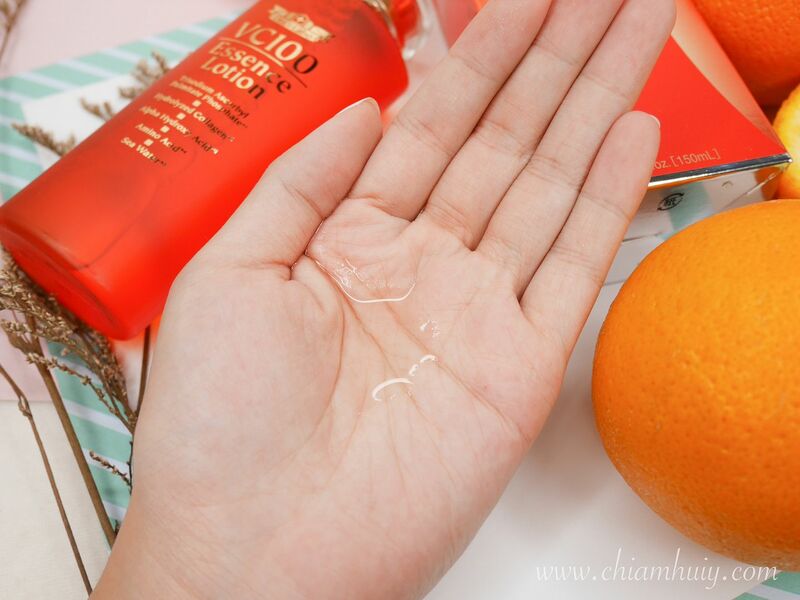 The clear essence lotion may look like water but it smells terrific! That citrus scent really lifts up the mood since I've always been a fan of all things zesty. When rubbed against my palms and eventually onto my skin, I was surprised that the essence lotion has a soapy texture. As it starts to dry, it turns a little sticky but it was all gone within half a minute or so. The essence lotion gets absorbed so quickly, it also leaves a non-sticky and lightweight texture. Generally, I have positive thoughts about this lotion. I like that it has a citrus scent that brings up the mood and gives my sense of smell a treat day and night when I apply the essence lotion. 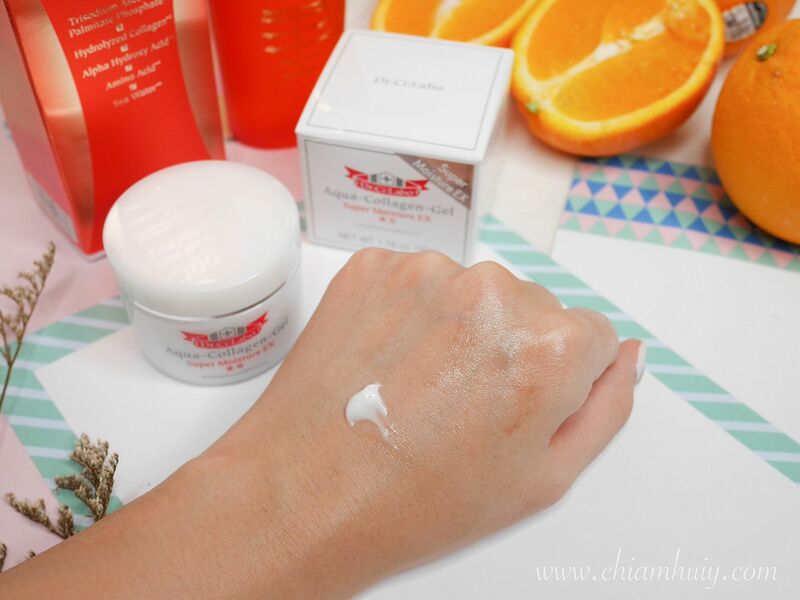 I love that this lotion is lightweight and gets absorbed into the skin rather quickly, leaving non-sticky texture. 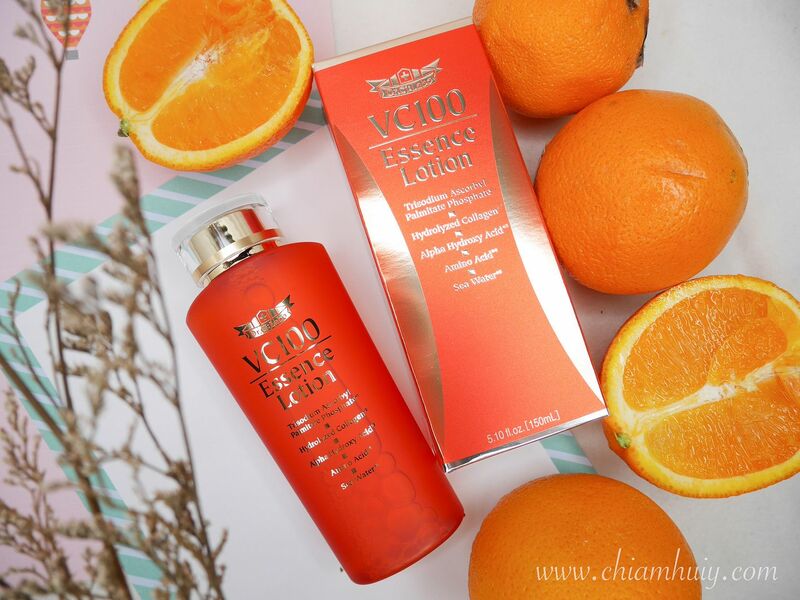 Most importantly, I am looking forward to the results after a longer term usage of this VC100 Essence Lotion. It's suggested that we use Dr.Ci:Labo Aqua Collagen Gel after the essence lotion to provide added moisture to our skin. When I first open the Aqua Collagen Gel, I don't deny that I got a little worried. Because of its opaque color, I thought it's a cream. It was until I swatched the gel on the back of my palm to finally got myself reminded that this is a gel! (hahaha silly me.) The gel may be opaque, but it spreads across as a transparent gel. It's definitely not as lightweight as the VC100 Essence Lotion, but it's light enough as a moisturiser. 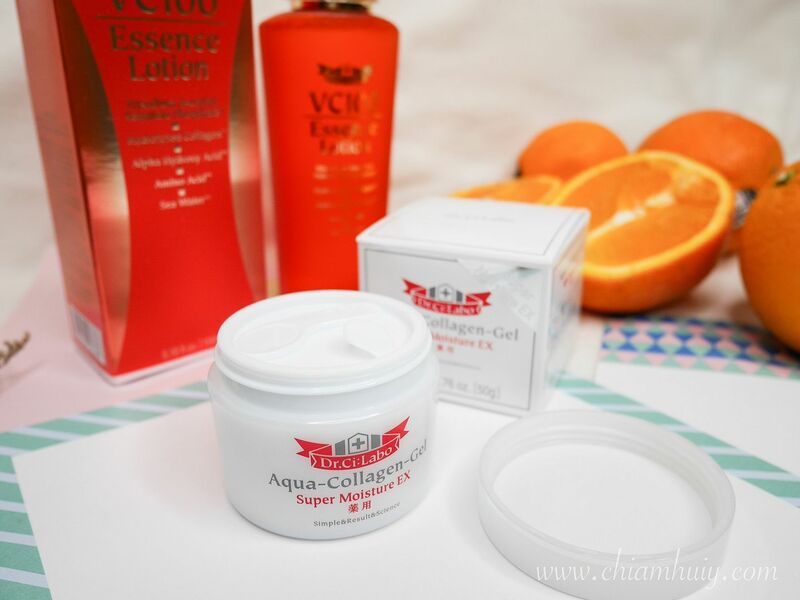 I got the Aqua Collagen Gel in Super Moisture since my skin is pretty dry. If you're afraid of breakouts like myself, you may apply in a smaller amount. 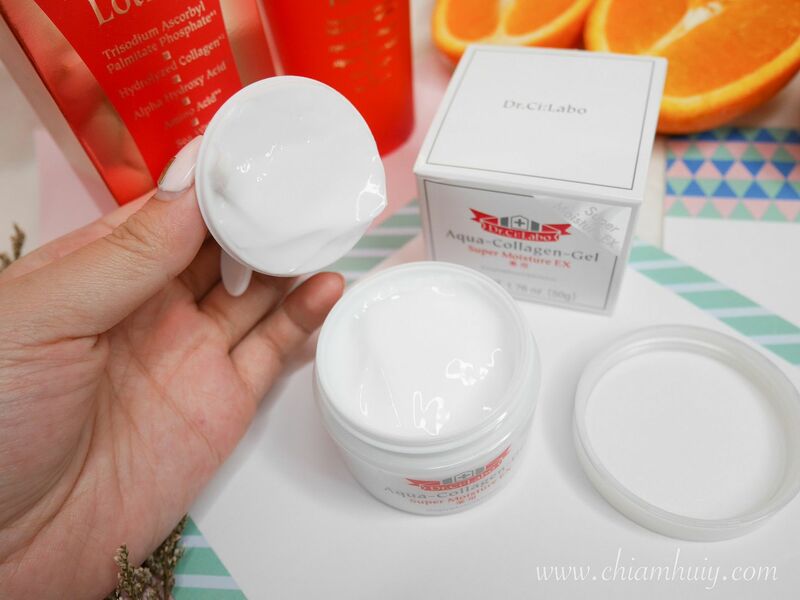 Dr.Ci:Labo Aqua Collagen Gel is actually very lightweight. 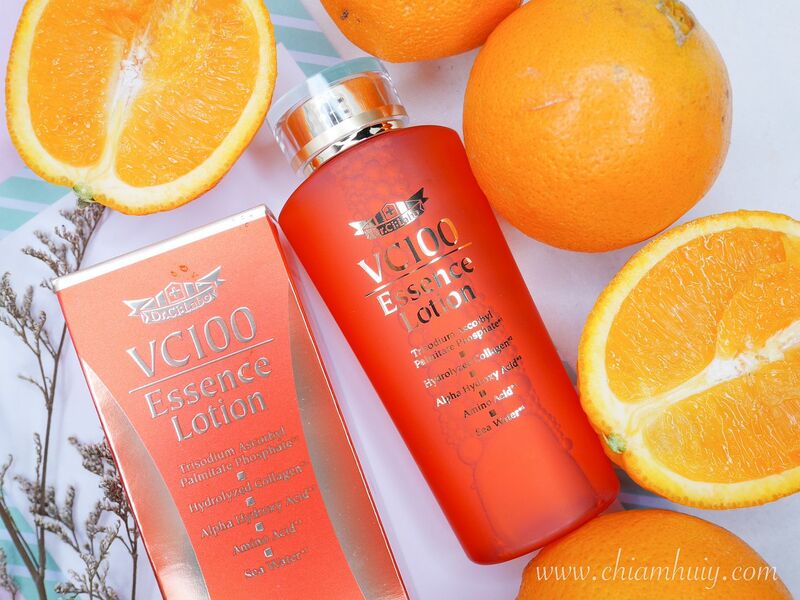 Dr.Ci:Labo VC100 Essence Lotion (150mL) retails at $83 via online at www.ci-labo.com.sg, #B3-41 Ion Orchard (tel no. 6238-8395) or Watsons (Ngee Ann City, Parkway Parade and Raffles City). Mother's Day is round the corner, and I can't think of the any better gift to give your beloved mum other than this amazing essence lotion! Check out their updates on Dr.Ci:Labo Facebook page or instagram for more updates and promotions.